Our Little Inspirations: She Believed.. I have a fun card I made using a SU! Hardwood background stamp along with a This Little Piggy stamp set for the image. I colored the piggy with Copics, die-cut the image panel with a MFT stitched circle die, and cut the scalloped mat with a SB die. The hardwood was stamped on kraft and sponged with 3 different distress inks. I added some pink twine and called this one done. The inside says simply "so she did!" I thought this would be encouraging for a child, so it's going into my next Cards for Hospitalized Kids box. Speaking of card donations, I added a link on my sidebar to the Caring Hearts Card Drive. Click it to be taken to the blog who hosts this event where Christmas cards are donated to nursing homes. I just sealed up a box of 126 cards heading there and this is why I make Christmas cards all year long. I have plenty for me to use personally and plenty to share with this great charity card drive. Great card, I like the saying and the fun image! I also like how the pink looks over the wooden background. Hope you are having a good Monday! I ABSOLUTELY LOVE IT. a Super card, what a lovely thought to take cards to Nursing Homes and a great idea too. Well done you. The background is over the top! Looks exactly like wood. Great job on that for sure. LOVE the little piggy too. FUN card! 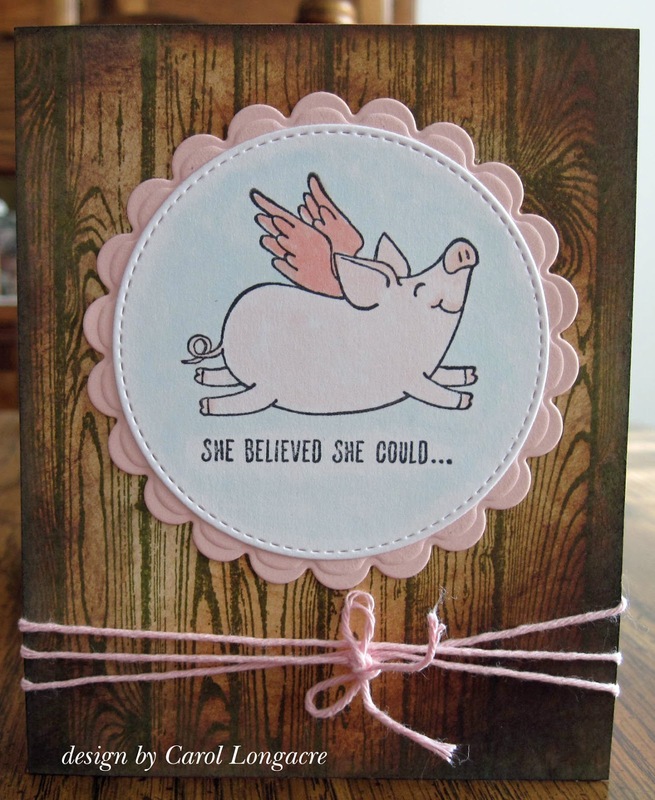 A super card Carol, such a fun image and encouraging sentiment. These piggies look so good with the wood that indeed, only some pink twine for your pink swine is needed. This flying pig looks so cute!!!! Her face makes me smile! How fun! Love the hardwood background, it seems true and the twine is a sweet detail!! Well anything is possible. I like that wood effect background and your inking up of it. Looks very authentic. Hugs Mrs A.
I have been loving all of the pig stamps that have come out lately! They are so much fun to use. This one is no exception! Simply adorable! This is too cute! Love the wood grain background and the way its darker in the corners. Way to go on all those cards for the nursing homes! A perfect answer to the age old question whether pigs have wings. lol Love your coloring, Carol and the simple design! We're really delighted to see you playing along in our "Anything Goes with a Critter" challenge at 2 Crafty Critter Crazies this month. Thanks so much for supporting our challenges and we hope to see you again soon.